BANS in pubs and clubs have helped reduce the number of young smokers by 30 per cent in the past year. The number of 18-29 year olds smoking dropped from 26.2 per cent in 2006, to 18.6 per cent in 2007, figures released by Quit Victoria revealed yesterday. Smoking was banned in Victoria’s 7000 pubs, clubs, gaming rooms and cigar bars on July 1 last year. Overall, the number of Victorians smoking has dropped from 21.3 per cent in 1998, to 17.3 per cent last year. But tobacco is still responsible for 4000 deaths in Victoria each year and costs the health system $5 billion annually, prompting a graphic new advertising campaign to further lower smoking rates. A new ad will hit TV screens this weekend, centring on the whistling noise of a woman breathing — the sound of air passing around a tumour as it tries to enter her lungs. According to a press release from Philip Morris, the new environmentally friendly cigarettes work by employing powerful carcinogens that accumulate in the lungs of smokers, slowly breaking down their vital organs and eliminating the danger posed to the overpopulated planet by the human race. Because Marlboro Earths take decades to work, the company stresses that people should start using them as early as possible, ideally during childhood or adolescence, in order to maximize the product’s effectiveness. Although industry research indicates people do offer some secondary benefits to the planet, such as recycling programs and wind power generators, studies have concluded these efforts fail to offset the disastrous potential of humanity. 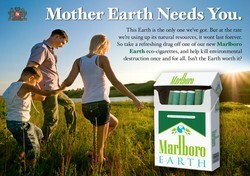 According to Philip Morris, Marlboro Earths are the first green product to address that threat head-on. The new cigarettes, released in limited test-market cities over the past two months, will be ready for a national rollout in mid-June. An ad campaign with the slogan “Marlboro Earth: Saving the Environment One Customer at a Time” has already been launched, and the product’s iconic new packaging, which is similar to the traditional Marlboro design but also features a tree, is reportedly testing “through the roof” with consumers. In initial product trials, the eco-cigarettes have proven popular among smokers. Philip Morris executives stressed that the new cigarettes, which contain the same great taste smokers have come to expect from Marlboro, but with nearly three times the tar and carbon monoxide, could make a huge difference in as little as 40 to 50 years, cutting down on urban sprawl, overpopulation, and eventually helping to enrich the soil with powerful fertilizers.